The jazz world has a royal family, and its name is Marsalis. 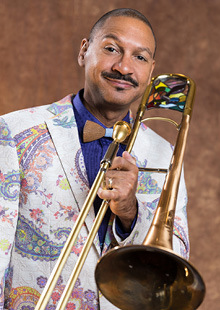 Delfeayo Marsalis, the trombone-playing member of the current generation of Marsalis jazz musicians, assembled a best-of-the-best jazz orchestra 10 years ago. Although the group began with the intent of keeping jazz traditions alive in the schools of New Orleans, Delfeayo and the orchestra have won a far wider audience than their target. Their sound is decidedly modern, but firmly rooted stylistically in the rich jazz history of New Orleans. Kick off Mardi Gras in true New Orleans style at our Offstage Artist Reception with Delfeayo Marsalis and the Uptown Jazz Orchestra. We'll be serving The Big Easy's official cocktail while you mingle with New Orleans Jazz royalty. $50 per person. Tickets are limited so call Performance Santa Fe to sign up. Underwritten by Ellen & Jim Hubbell; Sandra and David Marion; Robin Black.